56 • August 2018 • S I G N & D I G I T A L G R A P H I C S SPECIALTY IMAGING DIGITAL GRAPHICS A s the digital evolution continues to disrupt the longstanding tradi- tions of the sign making world, there are still a few product categories where old-fashioned, craftsman-styled work can have its place—and be profitable, for those who know how to work a niche. Screen printing once formed the backbone of the pre-digital sign-printing Screen printing can still offer valuable niche markets for customers looking for low-cost, high-volume advertising products. Andy Stonehouse is a freelance writer based in Greeley, Colorado. Keeping Old-School Techniques Fresh S C R E E N P R I N T I N G Hodgins says the sweet spot for him and a handful of other regional wholesale screen printers is still the lawn sign niche —those durable and visually impactful, low-cost signs pitching lawn-care com- panies or political candidates. They're certainly not high-tech products, but with simple color processes and inexpen- sive substrates, they've remained a profit- able product to focus on, even today, as long as they're part of a broader range of weekly print jobs. 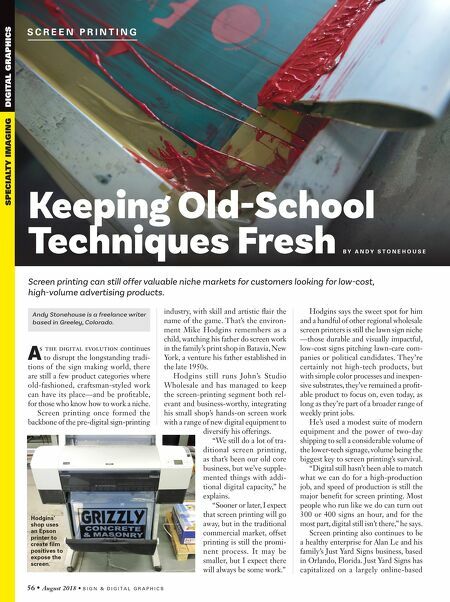 He's used a modest suite of modern equipment and the power of two-day shipping to sell a considerable volume of the lower-tech signage, volume being the biggest key to screen printing's survival. "Digital still hasn't been able to match what we can do for a high-production job, and speed of production is still the major benefit for screen printing. Most people who run like we do can turn out 300 or 400 signs an hour, and for the most part, digital still isn't there," he says. Screen printing also continues to be a healthy enterprise for Alan Le and his family's Just Yard Signs business, based in Orlando, Florida. Just Yard Signs has capitalized on a largely online-based B Y A N D Y S T O N E H O U S E Hodgins' shop uses an Epson printer to create film positives to expose the screen. industry, with skill and artistic flair the name of the game. 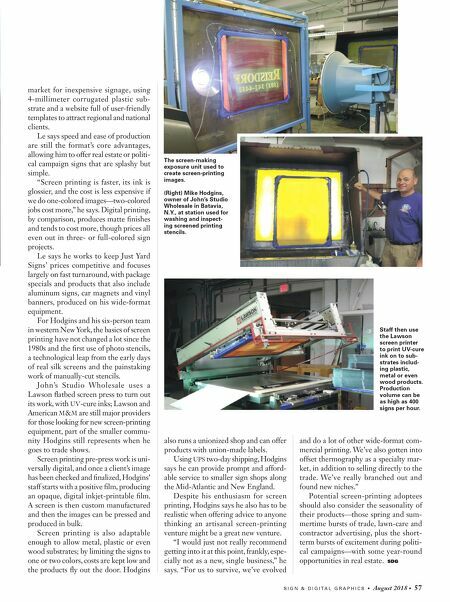 That's the environ- ment Mike Hodgins remembers as a child, watching his father do screen work in the family's print shop in Batavia, New York, a venture his father established in the late 1950s. Hodgins still runs John's Studio Wholesale and has managed to keep the screen-printing segment both rel- evant and business-worthy, integrating his small shop's hands-on screen work with a range of new digital equipment to diversify his offerings. "We still do a lot of tra- ditional screen printing, as that's been our old core business, but we've supple- mented things with addi- tional digital capacity," he explains. "Sooner or later, I expect that screen printing will go away, but in the traditional commercial market, offset printing is still the promi- nent process. It may be smaller, but I expect there will always be some work."